These cultivars were unique in providing alternative mature fruit color in the New Mexican pod type. Medium heat level. 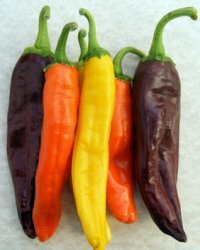 Adds great orange, yellow, or brown color to the pepper garden. Used for making colorful ristras in New Mexico.